Caffeic acid phenethyl ester (CAPE), an active component of propolis, has been proven to have anti-inflammatory and antiallergic properties. We have investigated the activity of CAPE in regulating cytokine-induced eotaxin production and its related signal protein, signal transducer and activator of transcription 6 (STAT6), in human lung fibroblast. The CCD-11Lu human lung fibroblast cell line was used as an in vitro model. Cells were pretreated with CAPE followed by stimulation with interleukin-4 and tumor necrosis factor alpha. The levels of eotaxin in cultured supernatants were measured by enzyme-linked immunosorbent assay. The amounts of STAT6 and phosphorylated STAT6 in cellular nuclear protein extracts were determined by Western blot analysis. STAT6 DNA binding activities were detected by electrophoretic mobility shift assay. Pretreated CCD-11Lu cells with noncytotoxic doses (0.1-10μM) of CAPE inhibited the production of eotaxin under stimulation of interleukin-4 (10ng/mL) and tumor necrosis factor alpha (10ng/mL). CAPE pretreatment also decreased the amount of phosphorylated STAT6 and the STAT6 DNA binding complexes in nuclear extracts. Honey is recognized traditionally for its medicinal properties and also appreciated as a topical healing agent for infected and noninfected wounds. This study evaluates impact of honey-based occlusive dressing on nonhealing (nonresponding to conventional antibiotics) traumatic lower limb wounds (n = 34) through clinicopathological and immunohistochemical (e.g., expression of p63, E-cadherin, and Collagen I and III) evaluations to enrich the scientific validation. Clinical findings noted the nonadherence of honey dressing with remarkable chemical debridement and healing progression within 11–15 days of postintervention. Histopathologically, in comparison to preintervention biopsies, the postintervention tissues of wound peripheries demonstrated gradual normalization of epithelial and connective tissue features with significant changes in p63+ epithelial cell population, reappearance of membranous E-cadherin (P < .0001), and optimum deposition of collagen I and III (P< .0001). Thus, the present study for the first time reports the impact of honey on vital protein expressions in epithelial and connective tissues during repair of nonhealing lower limb wounds. "The honey with its diverse chemical constituents (organic and inorganic) provide therapeutic support to nonhealing lower limb wounds with minimum trauma during redressing and debridement as well as in healing without hyper-granulation and less scarring. Further, therapeutic potential has been demonstrated at molecular levels through immunohistochemical depiction of prime molecular expressions in wound biopsies. The gradual increase in cell population and membranous expression of E-cadherin pointed out the transformation of nonhealing wound into healing one and achievement of collagen I and III ratio towards normalcy in posttherapeutic periods indicated proper deposition of collagens in the regenerated skin during healing." The antioxidant capacity of propolis from the southern region of Uruguay was evaluated using in vitro as well as cellular assays. Free radical scavenging capacity was assessed by ORAC, obtaining values significantly higher than other natural products (8000 µmol trolox equivalents/g propolis). 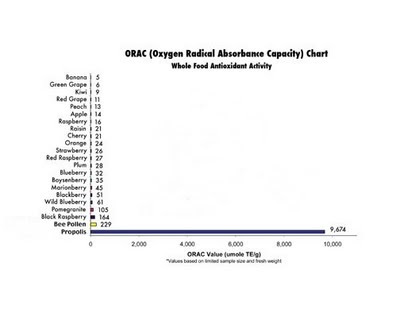 ORAC values correlated well with total polyphenol content (determined by Folin-Ciocalteau method) and UV absorption. Total polyphenol content (150 mg gallic acid equivalents/g propolis) and flavonoids (45 mg quercetin equivalents/g propolis) were similar to values reported for southern Brazilian (group 3) and Argentinean propolis. Flavonoid composition determined by RP-HPLC indicates a strong poplar-tree origin. Samples high in polyphenols efficiently inhibit low density lipoprotein lipoperoxidation and tyrosine nitration. In addition, we found that Uruguayan propolis were able to induce the expression of endothelial nitric oxide synthase and inhibit endothelial NADPH oxidase suggesting a potential cardiovascular benefit by increasing nitric oxide bioavailability in the endothelium. a great explanation from friend and fellow Apitherapist, Frederique Keller, L.Ac., Herbalist and creator of BeePharm Apitherapy Rx for Health products... the medicinal use of raw honey, bee pollen, bee bread, royal jelly, bee venom and much more! This study was conducted to evaluate the effect of ethanolic extract of propolis (EEP) on growth performance and plasma biochemical parameters of rainbow trout (Oncorhynchus mykiss). Graded levels of EEP [0 (control), 1, 2, and 4 g kg(-1) diet] were fed to trout juveniles (mean weight 7.73 ± 0.17 g) for 10 weeks. Dietary EEP supplementation regardless of inclusion level significantly improved the specific growth rate of fish. Similarly, supplemental EEP generally improved the feed efficiency ratio and protein efficiency ratio, but no significant differences were observed between the 1 g kg(-1) EEP group and the control group. In addition, dietary EEP supplementation generally increased the plasma superoxide dismutase, lysozyme, total antioxidant capacity, glutathione peroxidase, and catalase activities, but decreased the plasma malondialdehyde level. The plasma triglycerides level was significantly lower in the 1 or 4 g kg(-1) EEP group as compared with the control group. Dietary EEP supplementation generally decreased the plasma aspartate aminotransferase and alanine aminotransferase activities, but increased the hepatic aspartate aminotransferase and alanine aminotransferase activities. These results indicate the potential to use the EEP as a growth promoter, hepatoprotective agent, and immunostimulant for rainbow trout. Breast cancer (BC) patients use alternative and natural remedies more than patients with other malignancies. Specifically, 63–83% use at least one type of alternative medicine and 25–63% use herbals and vitamins. Propolis is a naturopathic honeybee product, and CAPE (caffeic acid phenethyl ester), is a major medicinal component of propolis. CAPE, in a concentration dependent fashion, inhibits MCF-7 (hormone receptor positive, HR+) and MDA-231 (a model of triple negative BC (TNBC) tumor growth, both in vitro and in vivo without much effect on normal mammary cells and strongly influences gene and protein expression. It induces cell cycle arrest, apoptosis and reduces expression of growth and transcription factors, including NF-κB. Notably, CAPE down-regulates mdr-1 gene, considered responsible for the resistance of cancer cells to chemotherapeutic agents. Further, CAPE dose-dependently suppresses VEGF formation by MDA-231 cells and formation of capillary-like tubes by endothelial cells, implicating inhibitory effects on angiogenesis. In conclusion, our results strongly suggest that CAPE inhibits MDA-231 and MCF-7 human breast cancer growth via its apoptotic effects, and modulation of NF-κB, the cell cycle, and angiogenesis. Objectives: To evaluate the antimicrobial effect by measuring the minimum inhibitory concentration MIC and minimum bactericidal concentration MBC of propolis, BioPure MTAD, 5% sodium hypochlorite (NaOCl), and 2% chlorhexidine CHX on Enterococcus faecalis (E. faecalis) and Candida albicans (C. albicans) in vitro. Methods: This study was performed in the Faculty of Dentistry and Pharmacy at Erciyes University, Kayseri, Turkey from February to April 2010. Ethanol extract of propolis (EEP) was prepared from propolis collected from Kayseri, Turkey, and proper media for microorganisms were prepared using sterile broth medium to give final concentrations between 0.002-2.4 mg/ml for propolis, 0.000125-0.512 mg/ml for CHX, and 1:2-1:4096 dilutions for NaOCl and BioPure MTAD. Using the macrobroth dilution method, MIC, and MBC values of irrigants on the growth of E. faecalis and C. albicans were determined. Results: Propolis and other irrigants were found to be effective on C. albicans and E. faecalis. Propolis and NaOCl were more effective in lower concentrations on C. albicans than on E. faecalis. In contrast, CHX and MTAD were more effective in lower concentrations on E. faecalis than on C. albicans. Conclusions: Propolis showed antimicrobial activity against E. faecalis and C. albicans. It appears that propolis is an effective intracanal irrigant in eradicating E. faecalis and C. albicans. The aim of this study was to evaluate the biochemical changes in cobalt-exposed rats and to investigate the potential role of Tunisian propolis against the cobalt-induced renal damages. Twenty-four pregnant Wistar rats were divided into four groups and were treated as follows: group 1 (control) received distilled water; group 2 received 350 ppm of CoCl2 in drinking water; group 3 received 350 ppm CoCl2 in drinking water and a propolis-supplemented diet (1 g/100 g of diet); group 4 received a propolis-supplemented diet (1 g/100 g of diet) without cobalt. In the cobalt group, a significant decrease in body, absolute and relative weights was noted when compared to controls. The administration of cobalt to pregnant rats from the 14th day of pregnancy until day 14 after delivery resulted in an increased level of renal malondialdehyde, a decreased renal content of glutathione and antioxidant enzyme activities such as superoxide dismutase, catalase and glutathione peroxidase in lactating rats and their pups. A statistically significant increase in plasma urea and creatinine serum levels was seen in treated female rats and their pups. Histopathologically, the cobalt-administration induced degenerative changes in the kidney of lactating rats and their pups. When compared with cobalt-treated rats, those receiving the propolis supplementation (along with cobalt-treatment) had lower malondialdehyde levels, higher antioxidant activities and the cobalt-related histopathological changes in the kidneys were at lower severity. Our results suggested that the propolis might be a potential candidate agent against cobalt-induced nephrotoxicity in adult and juvenile rats when administered to female rats during the late pregnancy and the early postnatal period. This is the first report of TRPA1 activation by fatty acids. Activation of TRPA1 and TRPV1 induces thermogenesis and energy expenditure enhancement. In this study, we searched for novel agonists of TRPA1 and TRPV1 from a nonpungent food, royal jelly (RJ). We measured the activation of human TRPA1 and TRPV1 by RJ extracts and found that the hexane extract contains TRPA1 agonists. The main functional compounds in the hexane extract were trans-10-hydroxy-2-decenoic acid (HDEA) and 10-hydroxydecanoic acid (HDAA). These are characteristic fatty acids of RJ. Their EC(50) values were about 1,000 times larger than that of AITC, and their maximal responses were equal. They activated TRPA1 more strongly than TRPV1. Their EC(50) values for TRPV1 were 2 times larger, and the maximal response was less than half of that for TRPA1. Next, we studied the potencies of other lipid components for both receptors. Most of them have higher affinity to TRPA1 than TRPV1. Among them, dicarboxylic acids showed equal efficacy for both receptors, but those are present in only small amounts in RJ. We concluded that the main function of RJ is TRPA1 activation by HDEA and HDAA, the major components of the RJ lipid fraction. HTLV-1 is the etiological agent of an aggressive malignancy of the CD4+ T-cells, adult T-cell leukemia (ATL) and other sever clinical disorders. The viral Tax protein is a key factor in HTLV-1 pathogenicity. A major part of Tax oncogenic potential is accounted for by its capacity of inducing the transcriptional activity of the NFκB factors, which regulate the expression of numerous cellular genes. Propolis (PE), a natural product produced by honeybees, has been used for long time in folk medicine. One of PE active components, caffeic acid phenylethyl ester (CAPE), was well characterized and found to be a potent inhibitor of NFκB activation. Therefore, the aim of this study was to pursue the possibility of blocking Tax oncogenic effects by treatment with these natural products. Human T-cell lines were used in this study since these cells are the main targets of HTLV-1 infections. We tried to determine which step of Tax-induced NFκB activation is blocked by these products. Our results showed that both tested products substantially inhibited activation of NFκB-dependent promoter by Tax. However, only PE could efficiently inhibit also the Tax-induced activation of SRF- and CREB- dependent promoters. Our results showed also that PE and CAPE strongly prevented both Tax binding to IκBα and its induced degradation by Tax. However, both products did not interfere in the nuclear transport of Tax or NFκB proteins.